As part of its plans to start charging customers for services, after a long 90 days of unlimited free services, Reliance Jio had recently announced the Jio Prime enrollment service. 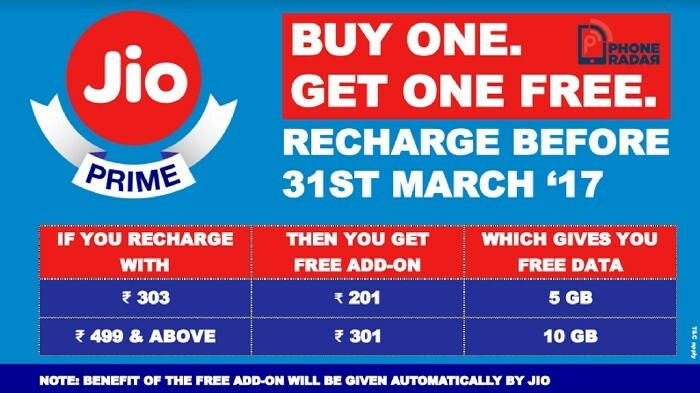 Now as an additional incentive to Reliance Jio subscribers opting for the Jio Prime service, the new-comer is apparently offering a Buy One Get One Free scheme. According to reports from PhoneRadar, Reliance Jio is planning to offer a Buy One Get One Free scheme for Reliance Jio subscribers who enrol for the Jio Prime service before March 31, 2017. With the service becoming paid starting from April 1, 2017, Jio Prime users would be offers additional data benefits beyond the regular benefit. With the Buy One Get One Free scheme, Jio Prime users would get a free Rs. 201 add-on pack on recharging with the Rs. 303 pack, thereby giving them additional 5 GB data. Similarly, Jio Prime users recharging with Rs. 499 and above, would get a free Rs. 301 add-on pack which offers an additional 10 GB of data. With the Jio Prime services, Reliance Jio intends to get its subscribers to pay an upfront membership free of Rs. 99 to enjoy additional benefits. The Jio Prime subscribers can continue to enjoy the benefits of the Happy New Year Offer till March 31, 2018 by just paying Rs. 303 per month.